When it comes to learning new technology such as deep learning, configuring your development environment tends to be half the battle. Different operating systems, hardware, dependencies, and the actual libraries themselves can lead to many headaches before you’re even able to get started studying deep learning. These issues are further compounded by the speed of deep learning library updates and releases — new features push innovation, but oftentimes break previous versions. Your environment can quickly become obsolete, so it is imperative to become an expert in installing and configuring your deep learning environment. 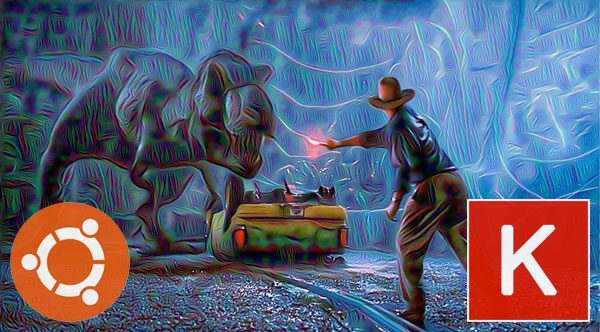 Now that Deep Learning for Computer Vision with Python has officially released, I’ll be publishing three posts this week where I will demonstrate how to stand up your own deep learning environments so that you can get a head start before you dive into reading. As you start to walk the path to deep learning and computer vision mastery, I’ll be right there with you. To get started configuring your Ubuntu machine for deep learning with Python, just keep reading. Accompanying my new deep learning book is a downloadable pre-configured Ubuntu VirtualBox virtual machine with Keras, TensorFlow, OpenCV, and other computer vision/machine learning libraries pre-installed. By far, this is the fastest way to get up and running with Deep Learning for Computer Vision with Python. That being said, it is often desirable to install your environment on the bare metal so that you can take advantage of your physical hardware. For the GPU install tutorial part of this series it is a requirement that you be on the metal — a VM just won’t cut it since it doesn’t have access to your physical GPU. Taking note of the steps, you will see that Deep Learning for Computer Vision with Python supports Python 3. Python 3 will be the standard on PyImageSearch going forward as it is stable and quite frankly the future. 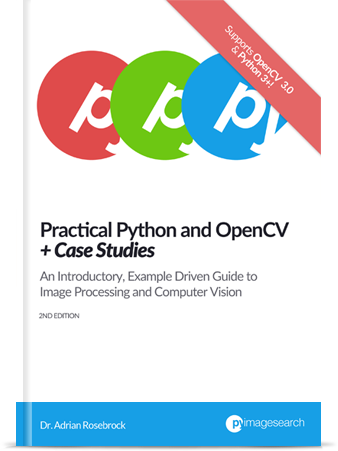 Many organizations have been hesitant to adopt Python 3 at first (me included, as there was no Python 3 support for OpenCV until OpenCV 3), but at this point if you don’t adopt Python 3 you will be left in the dust. Expect PyImageSearch Gurus course content to be compatible with Python 3 in the near future as well. Notice that we have chosen Keras as our deep learning library. Keras “stands out from the rest” of the available libraries for it’s ease of use and compatibility with both Tensorflow and Theano. My deep learning book focuses on fundamentals and breaking into the field with ease rather than introducing you to a bunch of libraries — so for the Starter Bundle and Practitioner Bundle, I demonstrate various tasks and exercises with Keras (as well as implementing some basic neural network concepts by hand). The ImageNet Bundle takes advantage of mxnet as well. While we will be primarily using Keras in my book, there are many deep learning libraries for Python, and I encourage you to become familiar with my top 9 favorite Python deep learning libraries. To get started, you’ll want to have some time on your hands and access to an Ubuntu machine’s terminal — SSH is perfectly suitable if your box is in the cloud or elsewhere. Let’s begin! The purpose of this step is to prepare your system with the dependencies necessary for OpenCV. We’ll wrap up Step #1 by installing the Python development headers and libraries for both Python 2.7 and Python 3.5 (that way you have both). Note: If you do not install the Python development headers and static library, you’ll run into issues during Step #3 where we run cmake to configure our build. If these headers are not installed, then the cmake command will be unable to automatically determine the proper values of the Python interpreter and Python libraries. In short, the output of this section will look “empty” and you will not be able to build the Python bindings. When you get to Step #3, take the time to compare your output of the command to mine. Let’s continue on by creating a virtual environment to house OpenCV and Keras. In this section we will setup a Python virtual environment on your system. I’ve mentioned this in every single install tutorial I’ve ever done, but I’ll say it again here today: I’m a huge fan of both virtualenv and virtualenvwrapper. These Python packages allow you to create separate, independent Python environments for eachproject that you are working on. In past install tutorials, I’ve presented the choice of Python 2.7 or Python 3. At this point in the Python 3 development cycle, I consider it stable and the right choice. You may elect to use Python 2.7 if you have specific compatibility requirements, but for the purposes of my new deep learning book we will use Python 3. Regardless of which Python version you decide to use, the end result is that we have created a Python virtual environment named dl4cv (short for “deep learning for computer vision”). You can name this virtual environment whatever you like (and create as many Python virtual environments as you want), but for the time being, I would suggest sticking with the dl4cv name as that is what I’ll be using throughout the rest of this tutorial as well as the remaining install guides in this series. Figure 1: Inside the dl4cv virtual environment denoted by ‘(dl4cv)’ in the prompt. Figure 2: Outside of the dl4cv virtual environment. Simply execute the ‘workon dl4cv’ command to get into the environment. In this section we will install and compile OpenCV. We’ll start by downloading and unarchiving OpenCV 3.3. Then we will build and compile OpenCV from source. Finally we will test that OpenCV has been installed. You may need to expand the commands above to copy and past the full path to the opencv_contrib file. Before we move on to the actual compilation step make sure you examine the output of CMake! 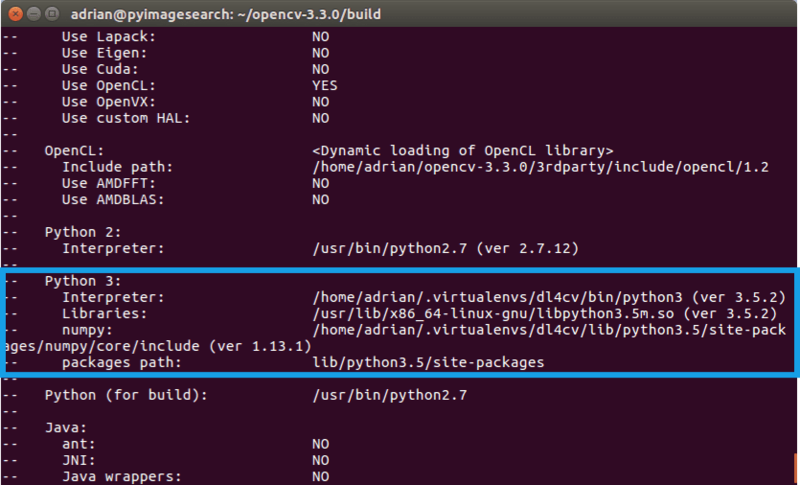 Figure 3: Checking that Python 3 will be used when compiling OpenCV 3 for Ubuntu. Pay attention that the Interpreter points to our python3.5 binary located in the dl4cv virtual environment while numpy points to our NumPy install. If this is the case, access the dl4cv virtual environment using workon dl4cv and re-run the command outlined above (I would also suggest deleting the build directory and re-creating it). Note: You can try a version of the -j4 flag corresponding to the number of cores of your CPU to achieve compile time speedups. In this case I used -j4 since my machine has four cores. If you run into compilation errors, you may run the command make clean and then just compile without the parallel flag: make . Figure 4: OpenCV compilation is complete. Notice that I am using Python 3.5 in this example. If you are using Python 3.6 (or newer) you’ll want to update the paths to use your version of Python. Secondly, your .so file (i.e., the actual OpenCV bindings) may be some variant of what is shown above, so be sure to use the appropriate file by double-checking the path. Make sure you are in the dl4cv virtual environment before firing up Python ( workon dl4cv ). When you print out the version, it should match the version of OpenCV that you installed (in our case, OpenCV 3.3.0 ). That’s it — assuming you didn’t encounter an import error, you’re ready to go on to Step #4 where we will install Keras. Notice how we are using the CPU version of TensorFlow. I will be covering the GPU version in a separate tutorial. Again, do this in the dl4cv virtual environment. Congratulations! You are now ready to begin your Deep learning for Computer Vision with Python journey. In today’s blog post, I demonstrated how to set up your deep learning environment on an Ubuntu machine using only the CPU. Configuring your development environment is half the battle when it comes to learning new techniques, algorithms, and libraries. 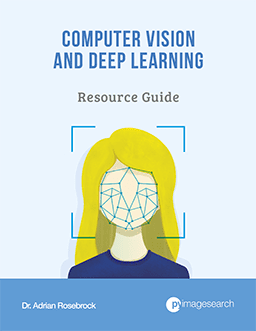 If you’re interested in studying deep learning in more detail, be sure to take a look at my new book, Deep Learning for Computer Vision with Python. The next few blog posts in this series will cover alternative environments including macOS and Ubuntu (with GPU support). Of course, if you’re interested in pre-configured deep learning development environments, take a look my Ubuntu virtual machine and Amazon EC2 instance. If you are interested in learning more about computer vision and deep learning, be sure to enter your email address in the form below to be notified when new blog posts + tutorials are published! So are we forced to use Ubuntu 16? I created this tutorial with the intention of Ubuntu 16 being used. I would suggest using Ubuntu 16. I wouldn’t recommend using older operating system just for one package! In fact, you can see versions newer than 16.x already have OpenCV >3.0 so you probably don’t even need to manually compile it on newer OS and newer packages. That should same some time and clean up above where you have 8 different commands for users to paste into the terminal. I do not recommend installing OpenCV via apt-get. You will install an older version and likely without the “contrib” module which is important for other applications of computer vision. It’s also possible to use a pre-created dockerfile to get setup with a full Cuda/CuDnn/Keras/Theano/TensorFlow/jupyter/OpenCv environment in ubuntu that has access to the cpu and gpu. This is using something called nvidia-docker and is probably the easiest way to have a full running gpu stack. I’ve used it successfully all weekend to work through the first 12 chapters of the deeplearning book. Here’s more info.. .https://github.com/floydhub/dl-docker. For me, having a full docker stack that doesn’t require any changes to the host system makes things extremely portable and easy to configure. I’ve used Docker + GPU before, the biggest problem is that it’s a huge support burden for me personally. Some PyImageSearch readers are just getting started and Docker is overkill so a simple VM with a nice GUI is more appropriate. Some readers are more advanced and want to work with the “bare metal”. Docker is excellent and makes life easier and I do hope I can cover it in the future. But for the time being I simply need to create a baseline of install instructions that “work”. The more the better. I would recommend at least 16GB to start (including OS files), especially if you intend on following next week’s blog post on GPU + CUDA. Keep in mind that you’ll not only need space for the drivers but for any code + datasets you want to work with as well. 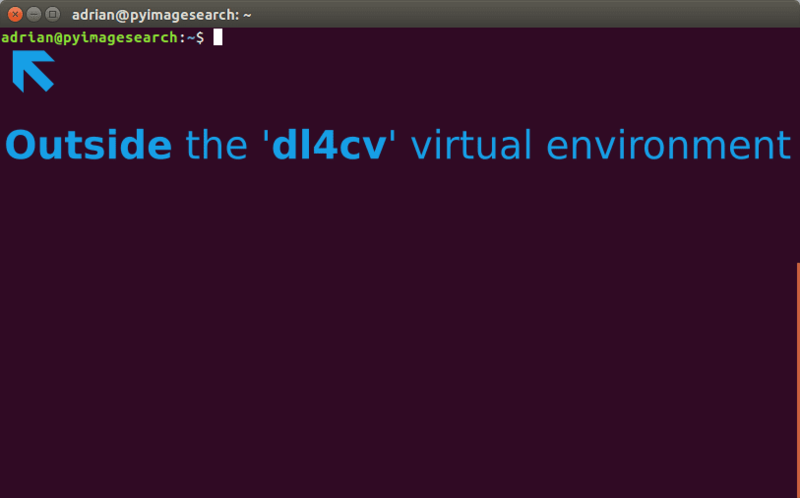 Can you also post a tutorial for installing CUDA support for OpenCV with Python on Ubuntu. Like I’m able to set it up but have to go through a bunch of tutorials. So if you can enumerate the steps (in your style) it would be awesome! Yes, this coming Wednesday (September 27th, 2017) I’ll be doing a GPU + CUDA install tutorial for Ubuntu. Great little tutorial…. I’m just wondering you prefer to compile opencv from source instead of plain install? Do you get more stuff this way ?? Also what about anaconda for a virtual environment. I’ve been using it for quite some time without issues? Again… with anaconda I can just install opencv?!? I’m not sure what you mean by “plain install”. Do you mean using apt-get? The reason is because the apt-get will install an older, out of date version of OpenCV. Compiling from source will allow you to pull in the latest OpenCV version, including the “contrib” modules. Anaconda does a better job of keeping their scientific libraries up to date, but again, compiling from source gives you the most control. There are a number of things that could be causing the problem. First, make sure that CMake correctly configured the Python 3 build and “python3” is in the list of OpenCV modules to be compiled. Secondly, make sure you sym-linked the resulting .so file (which are your actual Python bindings) into the Python virtual environment. 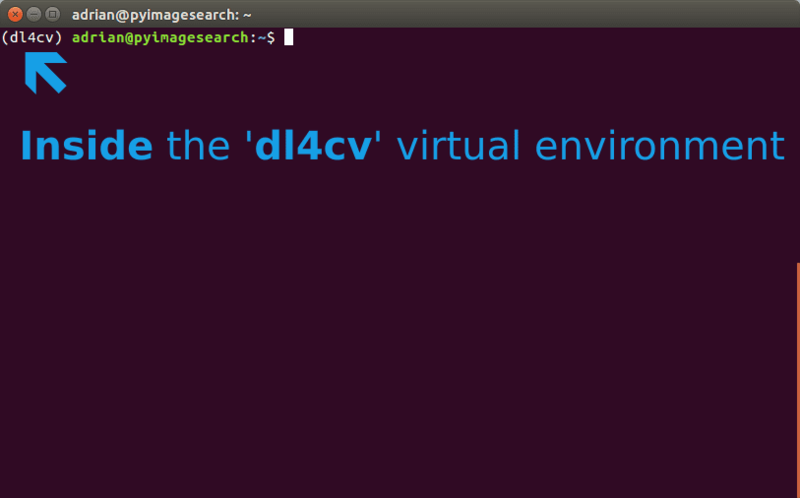 Finally, double-check that you are in the dl4cv Python virtual environment before running CMake. Are you using Python virtual environments? If so, I do not recommend this solution. Let your Python virtual environment set the PYTHONPATH accordingly. Yes, I am using Python virtual environments. However, the Python wasn’t setting the PythonPath. I’d be curious to learn more about your setup. Explicitly setting the PYTHONPATH shouldn’t be necessary. Definitely ensure that the .so file (i.e., your actual OpenCV bindings) are correctly sym-linked into your Python virtual environment. I also had this problem, it just needed to run “source ~/.bashrc” and then it worked fine. This comes at a fortunate time as I was just looking for something simliar, but I’m still looking into different frameworks: what do you think about pytorch? I have no experience but the autograd feature looks like a sweet component to have especially when playing around with the architecture, do you think keras (with any backend) is flexible enough for research? I plan on covering PyTorch vs. Keras in a future blog post, but my opinion is that Keras is more mature, more used, and has a larger community. PyTorch has a lot of nice features, but Keras is fantastic for both research and commercial applications. Thanks much for the great tutorial Adrian !! The install process was a smooth sail. It worked exactly as described. I have purchased the copy of DL4CV and anxious now to get my hands on the code !! Nice job on getting your system configured, Abhijit! And thank you for picking up a copy DL4CV 🙂 Were you able to download the code associated wit the book okay? Do you have any suggestion on this issue? Thanks! It sounds like CUDA is interfering with your compile. Please ensure that the -D WITH_CUDA=OFF flag is supplied to CMake. Hi Adrian , Do you think it’s possible to follow all the step to install keras in raspbian in my raspberry pi 3 ? Yes. Train the model on your GPU system. Serialize it to disk. Transfer it to your Raspberry Pi and then load it there. I detail a similar process inside my book, Deep Learning for Computer Vision with Python. Yes. 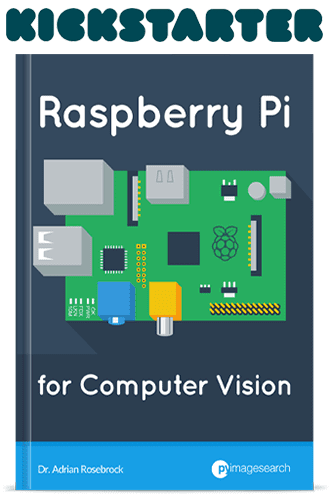 Since Raspbian is Ubuntu-based you can use these instructions to install Keras on your Raspberry Pi. what is that? what should I do? Try that and let me know if it resolves your issue. 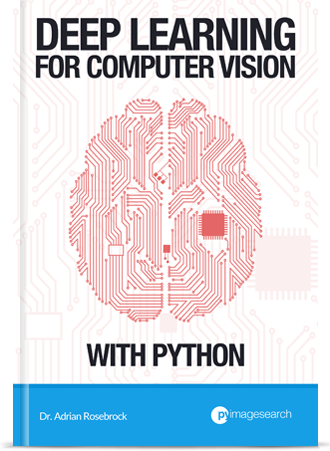 I also offer a pre-configured Virtual Machine which is ready to go with the Deep Learning for Computer Vision with Python book. I know this isn’t the ideal solution, but it would let you get to learning rather than fighting configuration issues. I have tried that,but it was the same problem.I not sure what’s wrong.Do you have any suggestion? It comes to the same problem.I was confused by it several days.Do you have more suggestion? Since you’re using ROS, see this SOF thread. I found the solution in the Stack Overflow link you shared. thanks! What is that mean?Was I success to install the opencv3.3.0? Hi Mr. Wang — Thanks for your comment. Did you use virtual environments as I instructed? You might not be in your new virtual environment. Did you compile from source or use a package manager to install OpenCV? what is that?and what should I do? Hi Reed — I’m glad you found a workable solution! Is it possible to make a backup of the vitrualenv so i do not have to reinstall everything when something goes wrong? You can run “pip freeze” to save all dependencies, but keep in mind that OpenCV also relies on libraries installed globally as well. I would suggest backing up your system if at all possible. I followed all the steps and I actually don’t know how to proceed. Thanks a lot. Hi Jose, did you make sure that the OpenCV-contrib package was included in your CMake command? Yes, I did, still the same error appeared. I started all over again and the error stopped. Thanks a lot! I’ve just finished the installation on the new Ubuntu 17.10 and I faced the problem with the fact that the Python3 is the default interpreter there, in the CMake configuration output there is no Python3 section and the cv2.so library was never built. For more info please reffer to https://github.com/opencv/opencv/issues/8425 and http://dalvikplanet.blogspot.co.at/2017/12/how-to-install-opencv-on-ubuntu-1710.html. Thanks so much for sharing! Not only do I really appreciate it but I’m sure other PyImageSearch readers will as well. I’ve looked online and they (https://stackoverflow.com/questions/39136040/python3-4-error-cannot-enable-executable-stack-as-shared-object-requires-inva) recommended running execstack on my files, which I did and it still doesn’t work. I’ve already tried redoing everything from scratch. Do you have any insights? My system is a 64-bit Windows 10 OS running Ubuntu. Thanks! Hi Arklegru — I’m sorry to hear about the issues installing OpenCV on your Ubuntu system. To be honest I have not encountered that error before but my guess is that there was a problem with your OpenCV + Python bindings. Go back to your “cmake” step and make sure your Python 2 or Python 3 section matches mind (depending on which version of Python you are using, of course). My guess is that you compiled OpenCV bindings for one version of Python (ex. Python 2.7) but are trying to import the bindings into a different OpenCV version (ex. Python 3). 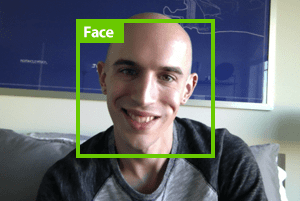 when building openCV, I couldn’t get the cv.so. And I discover in the log that I have no numpy information, ONLY interpreter information is there as is shown. I DO have installed numpy. Please help !!! That is very strange. You should not have needed to apt-get install NumPy. Also, you can ignore the “Python (for build)” section — that configuration is buggy. As long as your “Python 3” section is filled out correctly the compile will complete. I did this tutorial on a standard DigitalOcean Droplet and it worked great! Congrats on getting your Ubuntu system configured, Philipp! I am using Ubuntu 16, CPU. so please suggest a solution. i solved this issue by downgrading tensorflow==1.5. it’s a great tutorial. installation done successfully. earlier i installed tensorflow 1.10.1, so giving error. Thanks Adrian, finally i manged to install all the environments. Thank you very much Adrian. Thanks very much. Love your book and posts., helped me a lot. But I got a question, in all the commands involve ‘pip install’, do you actually mean ‘pip3 install’ instead? Since you have installed both python 2.7, python 3, pip 2, pip 3, the default of ‘pip install’ will be referring to python 2.7. Am I right? And how do I make a alias for pip3? I mean if I type ‘pip install’, actually I will be calling ‘pip3 install’, how do I change the names of it? Like change pip to pip2, pip3 to pip. No, once you are inside your Python virtual environment the “pip” command automatically detects your Python version inside the virtual environment and installs any packages into the “site-packages” directory of the virtual environment.